Compact, easy-to-use Bluetooth tool is USB-powered, offers No Hassles Decoding - just plug into the USB port and go! 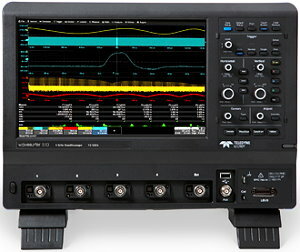 Fairport, NY, USA: Saelig Company, Inc. has announced the availability of the Teledyne LeCroy WaveSurfer 510 oscilloscope, which combines advanced 1 GHz 10 GSa/s specifications including MAUI with OneTouch user interface, powerful waveform processing, as well as advanced math, measurement, and debug features, to create an engineering tool that can help quickly analyze and find the root cause of circuit problems. The 12.1" touch-screen display of the WaveSurfer 510 is the largest in its class and makes viewing intricate waveforms fast and easy. The WaveSurfer 510 Oscilloscope delivers an effective sample rate of 10 GSs/s simultaneously on all 4 channels, with 1 GHz bandwidth and 32 Mpts of memory. The unit also offers a variety of serial data protocol decoders and advanced active probes. The MS-500-36 mixed-signal option adds the ability to capture long digital records of the fastest digital signals with maximum input frequency of 500 MHz for 18 channels or 250 MHz for all 36 logic channels. The long memory of 50Mpts/channel means that up to 25 ms of these fast signals can be captured at up to 2 GSa/s sampling rate. This makes it an ideal tool for embedded systems with 16-bit or 32-bit microcontrollers. The WaveSurfer 510's innovative MAUI with OneTouch gesture control interface design optimizes operational convenience and efficiency by allowing all common operations to be performed with a single touch of the display. It also enables finger-touch drag-and-drop actions for copying and setting up channels, math functions, and measurement parameters. It simplifies and speeds up measurement setup, improves operator efficiency, and brings new-user intuitiveness to oscilloscope operation. The LabNotebook documentation and report generation tool provides a fast way to save waveforms, save setups and screen images, report results, and offline viewing. The History Mode Waveform Playback allows you to scroll back in time to isolate anomalies and quickly find the source of problems. The Sequence Mode lets you capture many fast pulses in quick succession or join together events separated by long periods of time. The Serial Bus Trigger and Decode feature lets you view decoded protocol information on top of physical layer waveforms, triggering on protocol specific messages. The Spectrum Analyzer Interface views signal details in the frequency domain with a spectrum analyzer style user interface. Many 1 GHz oscilloscopes are available at attractive entry-point prices but are often limited in sample rate, memory, or features. The WaveSurfer 510, with its uncompromised 1 GHz /10 GSa/s /32 Mpts specification, is priced significantly less than most other 1 GHz oscilloscopes and delivers significantly more performance. Available now, the WaveSurfer 510 is priced at $12,900 from Teledyne LeCroy's authorized North American distributor Saelig Company, Inc. Fairport, NY. For detailed specifications, free technical assistance, or additional information, please contact Saelig at 888-7SAELIG, via email: info@saelig.com, or by visiting http://www.saelig.com/wavesurfer-510-scope/wavesurfer-510.htm.